Gerri Fern (Turner) Geitz, age 77, of Williams, died Monday, April 23rd at her home. Funeral services will be Monday, April 30th at 10:30 am at Bethany Lutheran Church in Iowa Falls with burial at the Belmond Cemetery in Belmond. Visitation will be Sunday, April 29th from 3-5 pm at Surls Funeral Home in Iowa Falls. Gerri Fern (Turner) Geitz was born on March 20, 1941 in Fort Dodge, Iowa, the daughter of John and Ferne (Manemann) Turner. She graduated from Eagle Grove High School and Iowa Central Community College with a degree in Elementary Education with a minor in Business. On April 5, 1964, Gerri was united in marriage to Earl Geitz at First Methodist Church in Eagle Grove. Gerri first priority was her family and working alongside her husband on the farm. Gerri was elected as the first female School Board President at Northeast Hamilton Community School and was the NEH PTA President for several years. Gerri was very involved with 4-H, Iowa Porkettes Association as Hamilton County and District 6 President and Rose Grove Township Polling Officer. Her first job was at Swaney Motors in Fort Dodge and then moved to Investors Diversified Services in Fort Dodge. Gerri retired in 2010 after several years as the Manager of the Dress Barn in Story City. During retirement, she continued her passion for education by being a mentor of elementary students at Iowa Falls-Alden School District. Gerri’s hobbies included her love of horses and flowers. 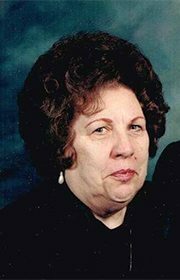 Gerri loved watching and attending her children’s and grandchildren’s activities and sporting events. Gerri is survived by her three children, Ed & Cheri Geitz of Iowa Falls and their children Katie, Rebecca and Alex; Rick and Stef Geitz of McLean, IL and Deann & Jim Geistler of Norwalk and their children Michael and Daniel and niece Nicole and Mark Phillips of Sterling, VA and their children Fleur and Liezel. She was preceded in death by her parents, her husband, Earl Geitz and her brother, John Turner.